On my never ending list of things to try, stand up paddle boarding (SUP) has always been pretty high up on there. I can’t exactly explain the lure behind it, but something about the merge of kayaking and surfing has always struck me as pretty darn appealing. So, needless to say – I was pretty stoked to try it last weekend. Within minutes of getting on a paddle board, I could already feel a lifelong addiction starting to grow. It was far easier than I thought it would be, and so much more fun than I ever expected. I’m hooked (no really – I’ve been scouring used SUP listings daily). Oh yeah! 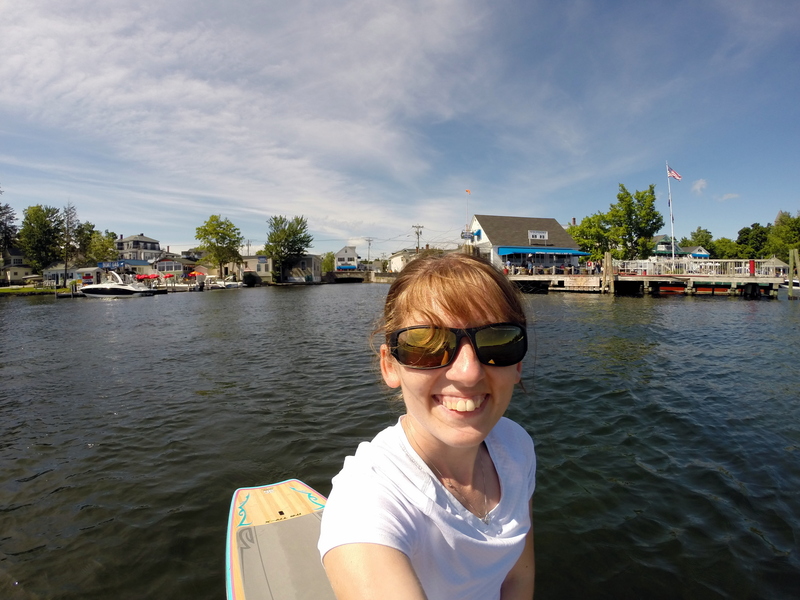 Selfies on a SUP… without falling off. Of course though, trying any new activity can be a total discouraging bust if it isn’t under the right circumstances and with the right instructor. Lucky for me (and my dad), we had a fantastic first lesson from Chris of SUPNH. It was everything it should have been and more. If you’re interested in giving SUP a try, then read on! Where? It’s hard for anyone to argue that Lake Winnipesaukee in the Lakes Region of New Hampshire is anything other than awesome and totally stunning and SUPNH is located right on it in Alton Bay. 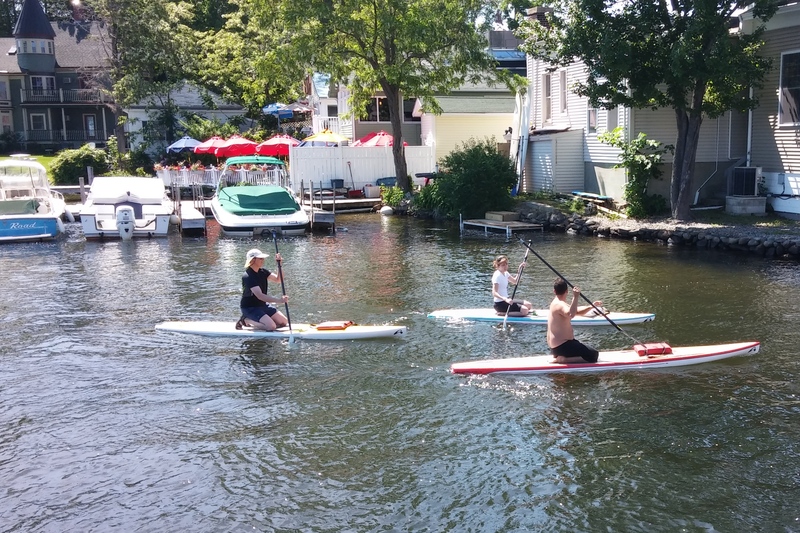 Unlike other SUP guides in NH, SUPNH has the perfect location to allow visitors to either get their bearings in a super peaceful cove that barely has any boat traffic or out in the bay amidst the waves, boats, and more. My dad and I got to experience both sides without ever having to get off our paddle boards and that was perfect for us. It totally made the learning curve a piece of cake. SUPNH’s board shop is about an hour and a half from Manchester, New Hampshire. It’s a great area to make a day trip out of as there’s plenty of shopping, sights, and well… the lake itself! Was so thankful for the gradual learning process. Definitely easy to start out like this! How Much? SUPNH offers lessons, tours, rentals, sales, and repairs so they have whatever you’re looking for. In our case, a one hour lesson with all equipment included was $38 a person. If you have a bigger group (4 or more), the price will drop quite a bit so it’s definitely something to keep in mind for a family experience, birthday, bachelor(ette) party, etc. Once you have a lesson under your belt, you’re welcome to rent from SUPNH at $30 for a half day rental. Who? First off, SUP is pretty friendly for a range of ages, skills, body types, and abilities so I think it’s fair to say just about everyone will enjoy taking part in the lessons and rentals. Our instructor showed us the best ways to sit, kneel, and stand on our boards so no matter your preference, you’ll feel comfortable! 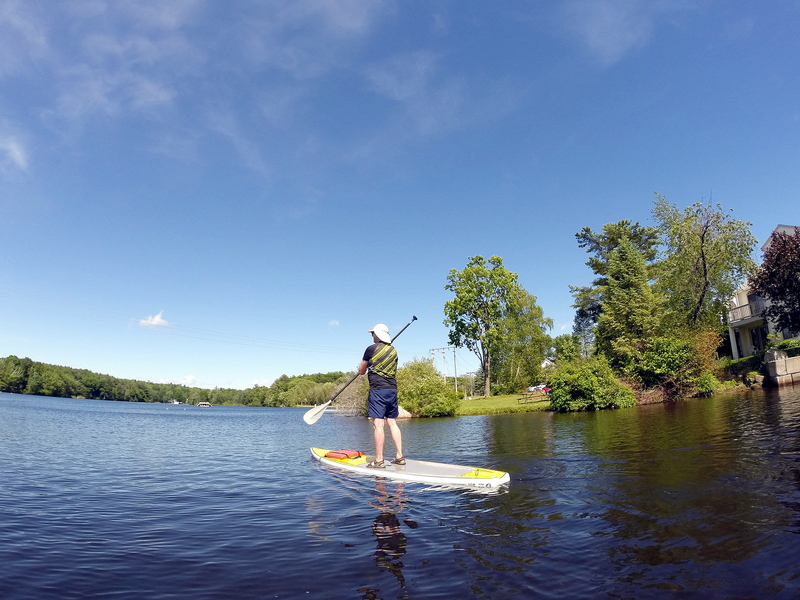 As for who teaches the lessons, we were fortunate to have Chris, the owner of SUPNH, as our instructor. While super knowledgeable, he was also the type of guide that you quickly forgot you were the student. He was super laid back and easy to get along with. It made for a great lesson. I’m confident the rest of the staff is just as personable. My dad looking like a SUP pro. Go Dad! A huge thank you to Chris at SUPNH for giving my dad and I such a fantastic lesson. I wasn’t sure how we’d do or if we’d even like it, but I think it’s fair to say we are both incredibly hooked and will be back soon. Thank you! 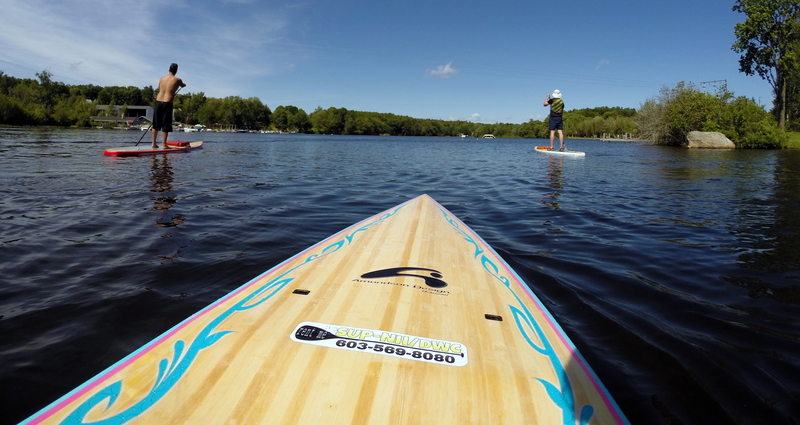 Stand Up Paddleboard NH- has a new location @ 5 Mount Major Hwy, in Alton Bay.